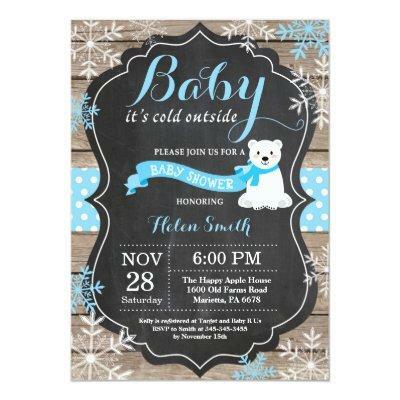 Baby its Cold Outside Rustic Winter Polar Bear Baby Shower invitation. Blue Snowflake. Rustic Wood Chalkboard Background. Country Vintage Retro Barn. Boy Baby Shower Invitation. Winter Holiday Baby Shower Invite. Blue and White Snowflakes. For further customization, please click the "Customize it" button and use our design tool to modify this template.